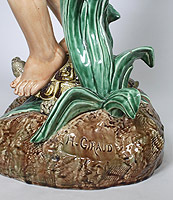 A French Late 19th Century Majolica Figural Jardinière modelled as a young Neapolitan Vintner balancing a weaved basket over his head, standing on the back of a tortoise on a rocky base amongst bulrushes. 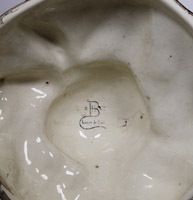 Mark for Choisy-Le Roy, H. Boulanger & Cie. Signed: H. Giraud. Circa: 1890. Henri Giraud (French/Belgian, 1805-1895). An identical sculpture was sold at Christie's New York - Sale 1940 - 19th Century Furniture, Sculpture, Works of Art and Ceramics on 25 October 2007, Lot 576. An identical sculpture was sold at Christie's New York - Sale 1940 - 19th Century Furniture, Sculpture, Works of Art and Ceramics on 25 October 2007, Lot 576.